Educators from four museums collaborated with artists, scholars, educators, and activists to craft socially engaged teacher Professional Development. Activities and resources encouraged the integration of history, culture, and identity through art into the classroom experiences of Chicago students. Museum Educators introduced a variety of visual literacy and critical viewing frameworks, shared a wide variety of artworks and community art projects, provided links to curricular redesign, and explored active engagement of teachers in this themed learning experience. Teachers engaged in arts creation and analysis created a sense of community for themselves and their students, and developed skills in arts integration into their classroom activities. In addition, teachers felt empowered to introduce social justice issues around the idea of space and community and integrated these into classroom projects with their students. Arts education helps provide a sense of identity to learners, along with a better understanding of cultural heritage. Activities in the arts enable students to “create their own artistic language and contribute to their emotional and cognitive development” (Bamford, 2009, p. 4). In addition, many believe that arts education can improve motivational as well as content-based learning. Research published in the past decade has linked arts education to improved literacy and critical thinking skills (CTS); students learning valuable critical thinking skills while talking about art could improve their understanding and analyzing of literary materials (as reported in NYT: R. Kennedy, July 27, 2006; original program called Learning Through Art). But arts education has also been under attack from budgetary and curricular reform for the past two decades. Most recently, the impact of increased standardized testing and the Common Core State Standards (CCSS) with their required PARC tests on learners and on school curricula has been widely discussed. Many detractors, especially school district personnel, have concerns regarding the CCSS and the accompanying requirements. But those of us interested in visual literacy know that the critical viewing skills developed by arts education activities designed to increase visual literacy abilities are essential to 21st century learners. This article shares the collaboration between museum and teacher educators, artists, community organizers, and scholars to design, create, and facilitate impactful and sustainable teacher programming that foregrounds the role of art as an agent of social change. Participants in the development of this professional development opportunity, a Summer Teacher Institute, were from the Jane Addams Hull-House Museum, Smart Museum of Art, National Museum of Mexican Art, and DuSable Museum of African American History in Chicago, Illinois, USA. The Institute—now in its third iteration—engaged teachers with museum collections, scholars, local artists, and activists to develop skills for supporting their students in making meaningful connections with art to address relevant social justice issues and support learning in core subjects. Professional learning outcomes for all involved included the opportunity to gain strategies for working across institutions and within communities, to guide teachers to integrate art into their practice, and to consider art integration as a lens for discussing vital social justice issues. Participants were involved in art creation activities as well as learning art interpretation strategies that support reflection and activism. In this report, we share the strategies employed and the experiences shared by participants in Whose Streets? Our Streets! Art and Spatial Justice in the Urban Environment, the institute’s 2015 iteration. We also discuss how these experiences helped teachers learn to engage pressing social justice issues in their communities through the study and making of art. Resources used to support the presentation content included information on Intersectionality Critique Experience (ICE), Facilitated Dialogue, and Visual Thinking Strategies, along with critical art education and curriculum integration strategies. The Jane Addams Hull-House Museum (JAHHM), in partnership with the Smart Museum of Art, the DuSable Museum of African American History, and the National Museum of Mexican Art (NMMA), implemented the program in August of 2015. The program served 19 educators through a five-day professional development institute and an ongoing series of subsequent classroom and museum engagements. The program was developed by a planning committee composed of museum professionals and K-12 educators who participated in Museum and Migration: Summer Teacher Institute 2013 and Activating Art for Peace and Justice: Summer Teacher Institute 2014, both developed by JAHHM, Smart, NMMA and DuSable museum educators after their participation in the Terra Foundation’s “Art at the Core of Learning” program. Building on the insights of the previous two years, Whose Streets? Our Streets! fused American art, art critique and creation, the Common Core State Standards and lesson planning activities, engaged learning activities, and community building. Interpretation: Teachers from the previous institutes expressed a desire to center the work around the voices and experience of their students. As such, the Institute invited Rashayla Marie Brown, Director of Diversity and Inclusion at the School of the Art Institute of Chicago, to train teachers on the method of Intersectionality Critique Exchange (ICE). This method helps diverse student populations to engage with fine art, literature, and historical artifacts through the intersectional lens of race, class, gender, and sexuality. Common Core: In response to teachers’ interest in bridging the gap between Common Core State Standards and the arts, the Institute featured Dr. Rhonda S. Robinson of Northern Illinois University who is a national leader in combining Critical Visual Literacy with the structure of the CCSS to deepen visual learning. Daily workshops focused on curriculum development, assessment and CCSS arts integration. Evaluation: Finally, in response to teachers’ requests for a more transparent evaluation process, the evaluation this year was focused heavily on formative feedback loops and daily reflections. Participants had opportunities to set goals for themselves for the week, share experiences, feedback, and progress with one another as well as with program planners. Teachers will increase capacity to make connections between their own lives and viewed artwork. Name a challenge in your community, and an asset/skill that members of your community bring to your setting or classroom. Consider justice, and what we mean by space. How can spaces represent community and be part of a solution to challenges in the community? With this overarching question as a guiding theme, the presentation examined the setting and the goals and themes. This Summer Institute was set in the city of Chicago, and the participants were selected from applicants drawn from members of the Chicago Public School teaching staff. Chicago has long acknowledged problems with hyper-segregation and racialized income disparity. Neighborhoods within which schools, their teachers and students are situated, often have issues of spatial justice aligned with these problems. 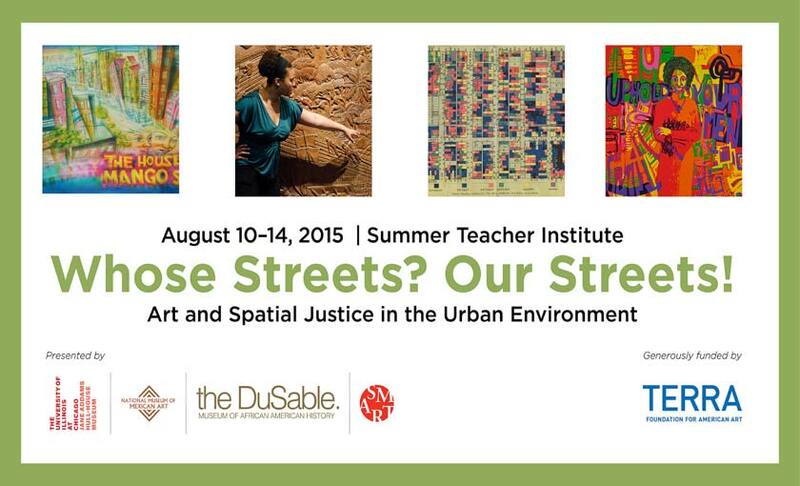 This Summer Institute Whose Streets? Our Streets! 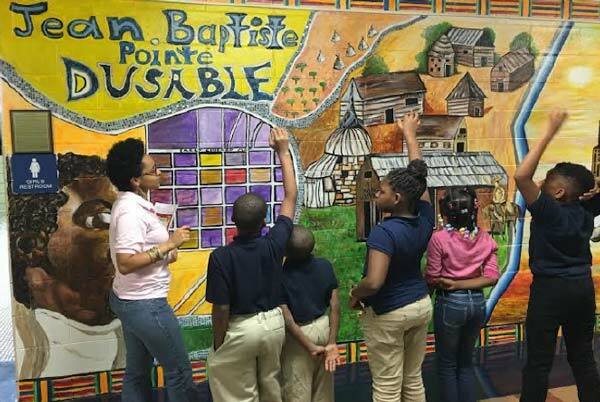 Art Integration from Museum to Barrio focused on the issues of spatial identification and spatial justice and the impact on awareness and social action that educators can make through arts integration in their classrooms. Teachers were involved for five days full of active learning, communication and the creation of a sense of community, experts’ presentations, and practice within some of the community “assets” involved four neighborhood museums, each of which focused on a spacial/racial/ethnic population within Chicago. The first day of the Institute was held in Hyde Park at the Smart Museum of Art’s Pop-Up museum at the University of Chicago’s Logan Center building. Reproductions of artworks from the Smart collection were provided as part of the exhibits shared with the teachers. How do people create visual languages to express the needs and interests of their communities? How can this language be employed to activate change in those communities? Activities included introductions and a focus on community problems foreseen by each participant. Our guest expert, Dr. Rashayla Marie Brown, Director of Diversity and Inclusion at the School of the Art Institute of Chicago, presented an overview of the method of Intersectionality Critique Exchange (ICE). Teachers practiced this technique in small groups, using prints from the collection which were related to recognizing and protesting community issues. They later practiced again with images in an exhibit at the Logan Center, taking turns analyzing and sharing understanding of selected images. What spaces have Chicago’s African Americans been forced into or out of? What spaces have they created for themselves? How have they used art to affect those spaces? In what ways do I relate to or in what ways am I affected by issues of spatial justice for Chicago’s African Americans? Teachers admitted early in the day that they were unsure of the term “spatial justice”, and the exhibits and experiences that day focused on helping them gain understanding. Presenters and activities were based upon the politics of space idea that the ongoing urbanization of the world is sometimes portrayed as a sort of natural process, as determined by economics or something else beyond the control of humans. The study of urban politics reveals a different truth altogether; that the process of urbanization is itself inherently political. An art creation activity. Teacher groups were provided with four images of artworks depicting elements of the Great Migration. Each group was asked to discuss these works, to think about sounds and images they evoke, and then to draw a representation which to them depicted a narrative across all four images. Their creations were presented and explained to the large group for discussion. What is the history of neighborhood development in Chicago? What factors impact where people in Chicago live, work, learn, and recreate? What makes a safe and thriving community? How can art be used as a tool to create safer communities? The history of the Hull House and its many social projects was highlighted in a tour of the museum. The artifacts included objects from one of the earliest childcare centers and objects made in the pottery studios by residents of the area. Exhibits also included the home, furniture, and historical photographic displays along with amazing maps of the neighborhoods, to help visitors understand the unique aspects of the community spaces created by JAHH. The guest artist was Maria Gaspar, from 96 ACRES, an artist collective working to draw attention to issues of special justice in neighborhoods. Their projects (http://96acres.org/) draw attention to the impact on the surrounding community of this large track of land occupied by the Cook County jail, one of the largest detention centers in the U.S. 96 Acres “uses multi-disciplinary practices to explore the social and political implications of incarceration on communities of color. Through creative processes and coalition building, 96 Acres aims to generate alternative narratives reflecting on power and responsibility by presenting insightful and informed collective responses for the transformation of a space that occupies 96 acres” (http://mariagaspar.com/section/391550-96-ACRES-Project-Excerpts.html). Gaspar shared video excerpts of some of the projects that 96 Acres has supported, including one which involved students from the NMMA youth programs using stencils with encouraging words (Today is Your Day) to power wash messages onto the sidewalks and stone barriers surrounding the jail; a sort of reverse graffiti. These projects directly address racial and economic injustices and engage the community around issues of equity and spatial justice. 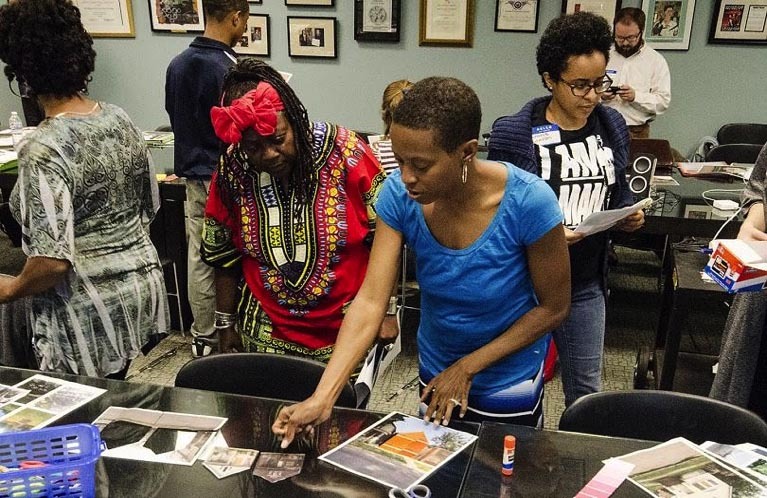 After this visual and video introduction to addressing issues in a west side Chicago neighborhood through art, teachers were energized to examine images from the JAHHM and the 96 Acres projects and take turns practicing ICE critiquing with a much clearer understanding of social and spatial justice. What makes a space valuable? How do spaces gain or lose value? How can a space that is said not to have value regain value? The NMMA was founded in 1982, when a group of Chicago Public School educators founded the museum, which opened its doors in 1987. Their goal was to establish an arts and cultural organization committed to accessibility, education and social justice, and to create a positive influence for the local Mexican community, since many other art institutions didn’t address Mexican or Mexican-American art. 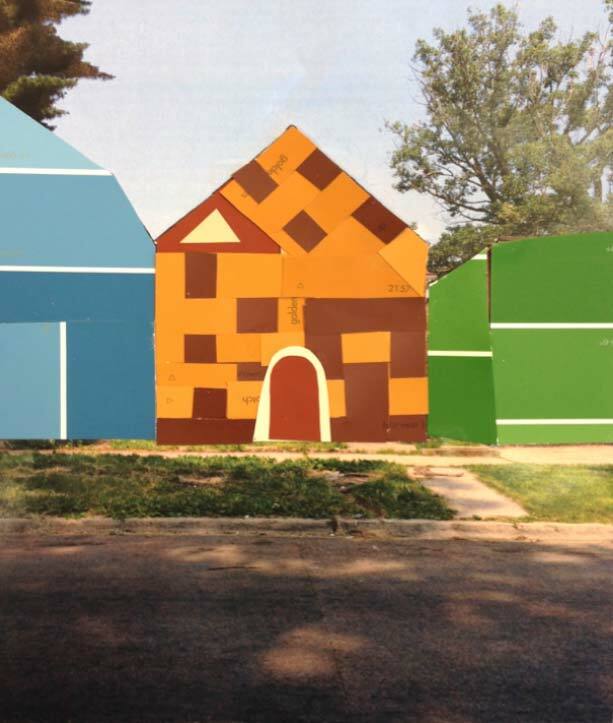 This session included a walking tour of neighborhood outdoor murals, a presentation by the artist/architect Amanda Williams, featuring her Color(ed) Theory Series, as she creates palettes by extracting colors from buildings and products that are frequent urban fixtures and uses them to paint abandoned houses on Chicago’s south side slated for demolition. Teachers worked with Williams’ ideas to create images of their own based upon palettes extracted from the communities in which they work and displayed their artwork. The ICE technique was practised in the NMMA’s galleries in small groups, with each teacher taking a turn to discuss a selected example. How have others interpreted these ideas and themes into their practice? What art integration ideas have been shared that can be adapted for your classroom? How can the CCSS be addressed by activities and assessments within your curriculum? Friday activities were focused on guiding teachers in designing and sharing new ideas, lesson plans and curricular integration initiatives for the coming school year. First, two teacher participants shared lesson ideas developed during the previous year’s Teacher Institute to provide examples of how lessons can be developed to reflect the themes and activities emphasized at institutes. Some lesson planning time was provided each day for teachers to discuss, explore resources, and ask questions regarding the development of new lesson plans. Friday the planners incorporated extensive time and sharing with the goal of ensuring participant readiness. Working in small teams or partnerships, teachers shared ideas, resources, wrote objectives, and paired new ideas with curriculum expectations and grade level activities. At the end of the session on Friday, teachers presented topics and shared activities and expectations for their students. They met again after one week to finalize lesson plans and share them with one another. As well, after the Institute, the lesson plans submitted by teachers included a wide variety of topics, activities, and a great deal of art critique and arts creation inclusion. The lesson plans also included 12 different strands of the Common Core State Standards which were identified and utilized to support the integration of art into K-20 curriculum. Teachers expressed being pleased with their lesson plan activities and excited about the support they would receive during the school year to continue to develop more arts integration into their classrooms. These participants agreed that they had improved their visual literacy, visual thinking strategies, and their Intersectional Critique Exchange practices, and could better integrate these skills into their own teaching settings than before participating in the Institute. The impact for their students would be significant; the integration of art, social justice themes, and CCSS would certainly be improved in the next year. “(I)n order to make art about social justice, a person must become aware that the world is unjust, and must be willing, not just to witness the injustice that exists, but to find visual strategies to address that injustice in ways that raise questions for both artist and viewer about the need to make changes in social reality” (Gail Tremblay, 2013, n.p.). Just prior to the 2015 IVLA conference in San Francisco, this image and note were received from a participant. Here I am leading my first small group Intersectional Critique at the museum I am building: The Black Chicago Museum! The children had some previous experience with the process using images from the summer institute program: Whose Streets? Our Streets! However, this was their first time viewing an actual art piece. They were able to hold a discussion about the piece. They REALLY enjoy looking at art work!! It’s because of this program I felt successful at leading them. Thank you! – LaNaye Lawson, 3rd grade teacher, Stagg School of Excellence, Founder The Black Chicago Museum, Inc. They exemplify the results of all the efforts to help encourage art integration within the theme, Art and Spatial Justice in the Urban Environment. Bamford, Anne (2009). The WOW factor: Global research compendium on the impact of the arts in education, 2nd ed. Munster, Germany: Waxman. Tremblay, Gail (2013). Creating art environments that address social justice issues. International Journal of Education and the Arts, 14(2.3). Retrieved from http://www.ijea.org/.